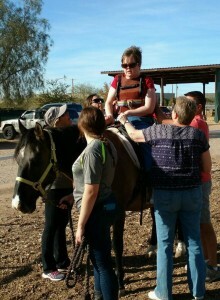 I’ve been asked to tell you about my experiences with hippotherapy, and I’m honored to do so. I had a stroke on October 5, 2014, a little over 3 years ago. It devastated my body, and my life. I lost balance, talk-ability, normal use of my right leg, and normal use of my right hand & arm. I’ve since been thru a ton of physical therapy, and I have to tell you that nothing has ever reached my body and brain like this. My first horse ride was a hard one. It was a totally new adventure, in so many ways. And the fear factor was enormous – for about 45 minutes. I then started relaxing, and I ended up losing my fear and gaining my balance. Of course, I was exhausted; but in a very good way. My next few rides have been purposely challenging, but never fearful. I’m now able to find my balance quickly, and each week I get better at maintaining my balance while riding. The therapist keeps stretching me, and I’ve already been able to do things I never thought possible – including greater walkability and balance. The program was set for 12 sessions. 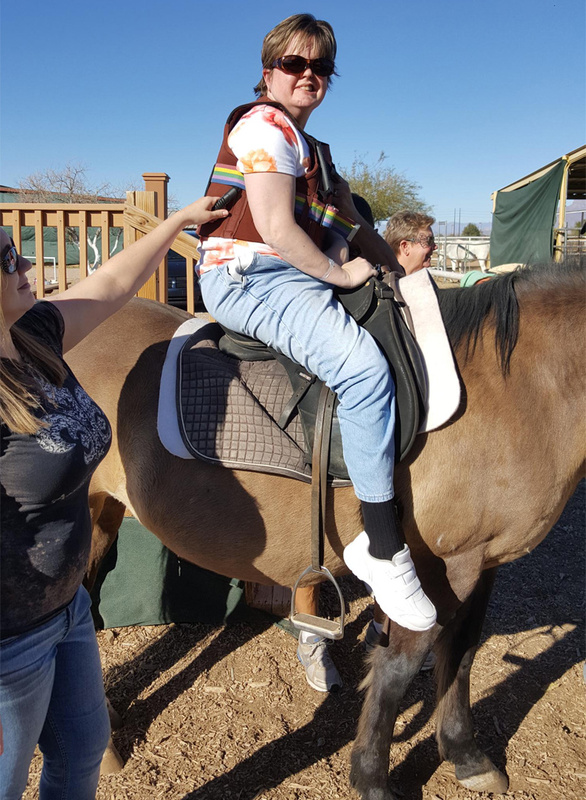 I had my 1st therapy session just before Christmas 2017 I was just trying this horse riding therapy to see if that will make a difference. For the past year, I have been through different kinds of therapy for balancing since my stroke. None of then has been effective. We are the proud parents of our beautiful twin 3 yr old daughters who were diagnosed with Autism at the end of summer 2009. Autism is a neurodevelopmental disorder that has varying degrees of severity. Not only is Autism the reason for Journey and Zaïg’s having lost all of their speech and communication skills, with this diagnosis we were faced with many new concerns as well . 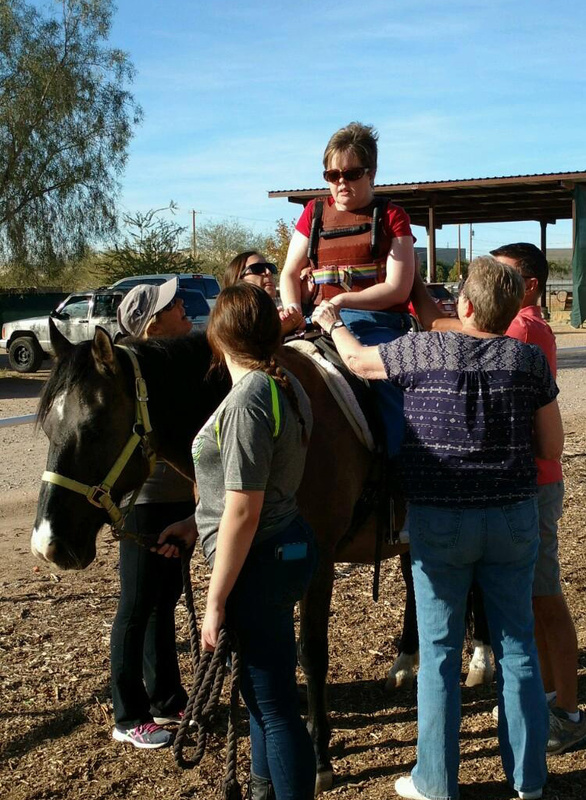 We were encouraged to begin a journey of hippotherapy by our daughters’ occupational therapist, Leslie, who highly recommended Hoofbeats with Heart only a short 8 weeks ago and we have never looked back! On their very first day it was easily identifiable that both girls had no speech, were very low-toned, had slim to no eye contact, auditory sensitivities, difficulty with motor control and coordination, along with an array of other sensory issues. As we unloaded the girls from our vehicle we quickly realized how naive we’d been to how alarming this new environment’s sights, sounds, smells, touch, and taste (dust in the wind) would be for the girls. They melted down from the sensory overloads they were experiencing. We immediately became cautiously optimistic as to whether or not the girls would ever want to ride horses at all. Much to our amazement, once introduced to the horses, Journey and Zaïg transformed right before our very eyes! They loved feeling their horses’ coats and manes, hearing the weird sounds their horses made through their noses & mouths, helping to feed them and watching the neat way they ate their food, and both girls smiled at the way their horses slowly moved beneath them as they rode. When Zaïg started to ride she truly seemed to enjoy it because she smiled and started humming aloud. Another trainer stopped to take note and asked “how old is your daugher and how long has she been riding?” to which my husband proudly responded with tears in his eyes, “she just turned 3 and has been riding a whole 10 minutes”. Evidently the trainer was shocked to hear it was her very first ride and told us she had excellent posture and appeared to be a natural at riding her horse. On the way home my husband and I were wondering out loud if Journey had enjoyed riding her horse as much as her sister and we were discussing how it was different to see that Journey preferred hugging her horse during her ride as opposed to sitting up and erect like her sister had done. At that very moment, during our converstaion, Journey reached out to touch me on my arm and said (clear as a bell), “mom”. Completely shocked at hearing her beautiful voice after so many months, I turned to see her smiling at me, making spontaneous direct eye contact, and then started to tear up as she nodded her head up-and-down really fast and giggled. We can’t thank HoofBeatsWithHeart enough for giving us back our little girls. My son Nathan is 4 years old and has Autism. 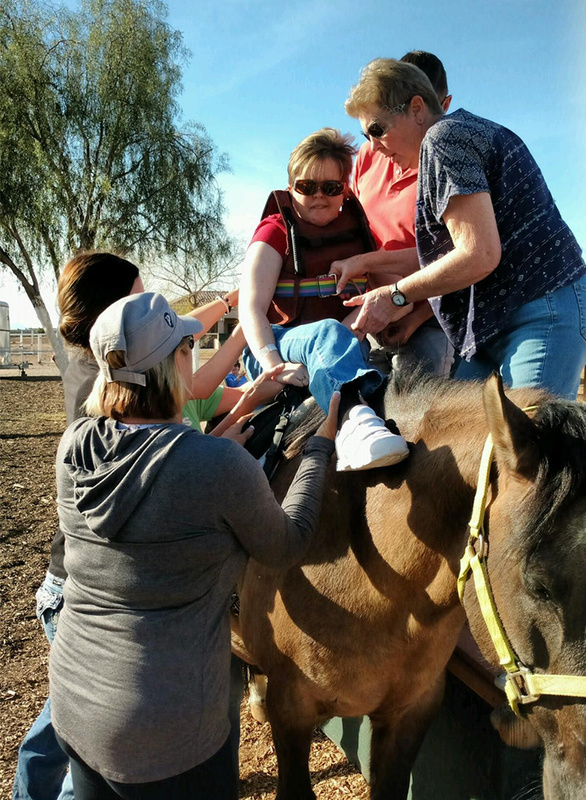 When first presented with the opportunity to try Hippotherapy with his Physical Therapist I was skeptical that he would even be able to join in the classes as he had to wear a helmet to participate. Nathan has never allowed anything to be near or on his head without a lot of anxiety. The first day it look three attempts to get the helmet on him and he screamed the entire session. Although I was discouraged, the staff and therapists were forever patient and they encouraged us not to give up. By only the third week Nathan was willingly putting his helmet on, even reaching to help put it on his own head, not a tear was shed, and he participated that whole session and every session after! He got such a great workout each week, especially strengthening his core, legs and upper body by working on repositioning and remaining stable on the horse as it moved through the obstacle course. By the end of the 12 week session he would start to get excited just when I turn the corner to come to the stables! My older boy has some sensory issues, so it was really good for him to get away from the every day life stimuli and into a complete other world. I really loved how his instructor included horse care basics into every session. It made the experience more salient, and meaningful; I truly believe that taking care of another being’s needs makes any child a better person. My younger son had occupational therapy on horse back, but it was so much more beneficial than that! He also has low muscle tone, and poor balance, so hippo therapy addressed both those issues at the same time. His therapist, Ms. Barb, kept the Hippotherapy sessions routine, so they were always consistent for my child. In addition, she kept them fresh by bringing a different lesson plan/theme every week. For example, a spring theme one week involved my son’s picking jelly beans from the therapist’s container on one side of the horse and pushing them through a hole into a container held by the side-walker on the other side of the horse. Had this activity been center-based, I’m sure Ms. Barb would still be picking up the jelly beans he’d flung around the room! 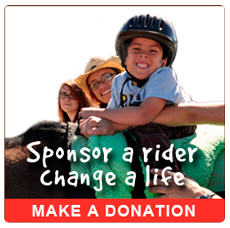 The hippotherapy, and theraputic riding programs were, without a doubt, time and money well spent for my boys. I cant wait for this fall’s sessions! When Melissa, our son’s physical therapist first recommended Hippotherapy for Jonah, I just was not sure. She described it as therapy on a horse that would encourage his brain to support what his body was trying to do (basically not to fight each other). It seemed strange to me how riding a horse was going to help this, but she explained that horses move very similarly to the way human beings move (even though they have four legs). Their sway and flow and the way they walk is much like ours and riding on the horse’s back would not only strengthen Jonah’s core muscles, but it would send signals to his brain telling him how his body “should” be moving, therefore encouraging his body to then follow suit and move the way it should. I was reluctant to try it. 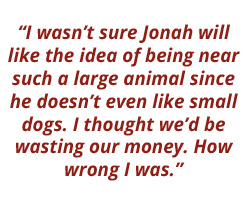 I wasn’t sure Jonah will like the idea of being near such a large animal since he doesn’t even like small dogs. I thought we’d be wasting our money. How wrong I was. We decided to give it a try. Initially, they couldn’t even get Jonah to go near the horse, much less get on it. To make matters worse, the horse property was also home to free roaming chickens. That was the straw that broke the camel’s back for Jonah. He refused to get out of the car on most days because he had to bypass the chickens to get to the horses. He wasn’t sure how he felt about the horses yet, so why should he bother having to deal with those unpredictable chickens, too! However, my husband and Melissa were consistent with Jonah, reassuring him he would be okay, and that the walk past the chickens to the horses was a short one. Eventually, Jonah began to develop a relationship with one of the horses, Snuggles, who became very fond of Jonah. Every time Jonah arrived, Snuggles would come right over and greet him, and they became very good friends. Jonah realized that he could come to trust Snuggles and eventually began to look forward to seeing him again. But he still had to deal with those pesky chickens. Over time, Jonah had become quite the little equestrian, riding forward and backward, slow then a bit faster almost to a slow trot. He was able to navigate the obstacle course like a well trained jockey. He was happy and peaceful every time he reunited with his good friend Snuggles. Even on the days Snuggles was unavailable, he quickly made friends with Amber and the other horses and apparently word had spread amongst the horses how cool a kid Jonah was to ride around! Getting out of the car became easier and easier with each lesson, to the point where we no longer had to drag him out crying and upset, but he quickly unbuckled his own seatbelt in excited anticipation! And on the mornings he woke up on the wrong side of the bed in a bad mood, if it was Wednesday, all we had to say was, “Jonah, do you want to go ride Snuggles?” He would reply, “YES” and straighten right up. He still never quite got over those darn chickens and to this day, he will steer clear of them at any given opportunity. But the most wonderful part of this entire experience is the larger life lesson learned. Sometimes in life, we must face our fears (the chickens) in order to get what we want (the horses). Jonah bravely faced his fear of those chickens each week and each week he was less and less afraid. It was a necessary evil, but one he braved like a true champion. If he (or we) had fed into those fears and avoided trying something new because there was an unexpected road block, we would have never learned how much Jonah truly loved riding horses and how beneficial it would become to his overall development. I command the Medical Hold Detachment (MHD-AZ) of the Arizona Army National Guard (AZARNG). The MHD-AZ is comprised of members of the AZARNG who have been become seriously ill or injured in the line of duty. Most of these men and women were injured while serving in combat in Iraq and/or Afghanistan. As the commander of these men and women, I am constantly faced with the challenge of finding medical, emotional, and even spiritual help for those who face these extremely debilitating injuries. I am constantly seeking help from both government services (U.S. Army, National Guard, Department of Veterans’ Affairs (VA), etc.) and even from charitable or commercial non-governmental services. 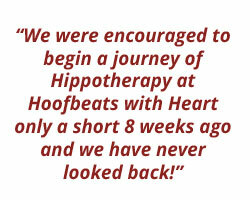 This is how the MHD-AZ became involved with the Hoofbeats with Heart. Through a lucky chance meeting, Master Sergeant Nicky Wells (my Readiness Sergeant) met the people from Hoofbeats with Heart and told them of our unit, it’s soldiers, and their immense recovery challenges. The Hoofbeats with Heart staff not only clearly understood the criticality of our soldiers’ injuries and situations, and their organizations’ unique ability to help these men and women, but offered to begin working via equine therapy and traditional counseling with our soldiers. As of this date, Hoofbeats with Heart has worked with over 20 of our wounded soldiers, and I and Master Sergeant Wells, have received very positive feedback from our troops. It appears that the counseling that my soldiers receive from the VA coupled with the therapy that they experience from Hoofbeats with Heart is a powerfully healing combination. I am grateful beyond words for what Hoofbeats with Heart has given to the men and women who have given so much to their nation. I whole-heartedly recommend this fine organization, their compassionate leadership and staff, and their outstanding program of healing to anyone who is struggling with emotionally debilitating injuries or memories. Any trust placed with this organization or capable staff will not be misplaced. Please feel free to contact me personally at anytime if you have any questions or need additional information about the MHD-AZ’s experiences with Hoofbeats with Heart.